– Kickstarter. Along with seeking sponsors, we decided to use the start-up crowd-funding service Kickstarter to raise money for KYC, a move that turned out to be a great way to involve friends and supporters in the project from the start and an all-around interesting experience. It was also where we made our biggest mistake. Kickstarter recommends entering a funding total that is the absolute minimum necessary for success. We entered $13,000, or about 85% of our budget. Our error became apparent almost immediately, when sponsors and supporters who, for various reasons, preferred to back us by cash or check directly and not through Kickstarter, began to contribute, creating two funding streams that we had to find a way to combine without violating either the rules or spirit of Kickstarter, which doesn’t allow changing the funding goal after a campaign has started or offer a simple mechanism for adding outside monies. In the end, we entered the combined contributions of several supporters as one lump sum (all backers, however, were acknowledged individually on the site). The backer who ensured our success on Kickstarter wasn’t an individual making one large donation, as some speculated, but the backer who gave the $40 that brought us to our goal. For a great analysis of using Kickstarter to fund a project, read Craig Mod’s Art Space Tokyo case study. We used Mod’s research to structure our support tiers, and found that backers at the $50 or higher levels — I’m writing here of just the contributors who directly gave through Kickstarter — were more than 50% of our supporters. Backers who gave outside Kickstarter — excluding sponsors — gave a minimum of $100, comprising the bulk of our funding. The take-away is that people will support projects to which they feel strongly connected, and at a level higher than might be anticipated. Something Mod addresses only slightly, and which I spent much time thinking about, was how to convert goodwill into support — Kickstarter doesn’t provide stats on how often a page is visited or referral sources, making it difficult to track the most effective messaging or determine a conversion rate. Based on traffic from the KYC placeholder site, along with Facebook stats, I estimated we converted approximately 1.5% of visitors to the Kickstarter page into backers. At that rate, and at the average pledge of $77, we would have had to reach approximately 12,000 interested people to hit our funding goal fully through Kickstarter. If I were using the service for a new project, I would base the goal on the total number of potential supporters that would most likely be reached, as well as the project’s budget and additional funding sources. For KYC, a more suitable goal might have been in the $5,000-$7,500 range. – Amazon Web Services. Because KYC would be live for such a short period, I wanted to avoid any down time, whether due to a traffic spike or hosting issue. To make our WordPress installation as fast and redundant as possible, I installed the plugin W3 Total Cache, instead of the usual WP Super Cache, and enabled both page caching and database caching. I then added Amazon Simple Storage, using it as a CDN for images and files; we used Brightcove for videos. Total costs were less than $350, mostly for the videos, and considering that there was at least one Dreamhost outage during our run, which affected other sites on the server, but affected KYC only on the backend, the set-up turned out to be well worth the time and expense. Our page load time was also consistently snappy, with one exception — Typekit, a hosted web font service that I’m using on more projects, would sometimes pop in a second or so after the rest of a page on a first visit. It was a minor inconvenience. – Blurb. 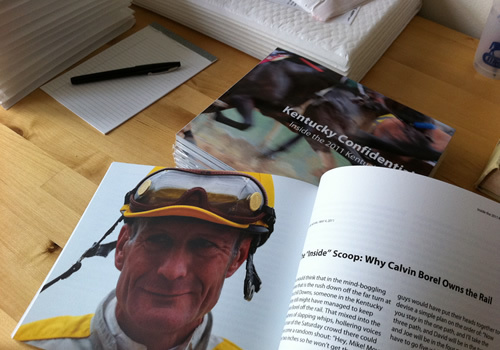 As a thank-you gift to backers giving more than $250, we published a keepsake KYC book (pictured above). Although I explored using a traditional printer, I knew print-on-demand would most likely be our most cost-effective choice because we were doing such a small quantity. The service we ended up using was Blurb, which recently added Mohawk premium papers as a printing option. We went with the ProLine Uncoated, a textured, creamy, matte paper that really showed the full-bleed photographs to good effect. Price per book was $41, but the quality surpassed my expectations. Thanks to everyone who supported KYC. We had a great time, and I know my collaborator, John Scheinman, as well as several of our awesome contributors, are eager to come back next year for the entire Triple Crown season. Note: I’ve temporarily turned off comments because of a spam surge.